Rick (Brendan Fraser) and Evelyn (Rachel Weisz), now married with a young son named Alex (Freddie Boath), work as archaeologists. They are looking into artifacts surrounding the legend of The Scorpion King, who is said will rise from the underworld to lead the army of Anubis to wipe out the world. Meanwhile, the reincarnated love of Imhotep (Arnold Vosloo) attempts to once again resurrect him so he can kill the Scorpion King (Dwayne 'The Rock' Johnson) and take control of Anubis's army for himself. 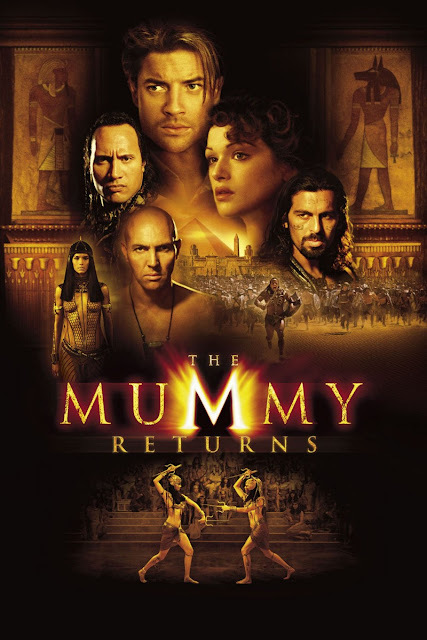 "The Mummy Returns" is the sequel to 1999's "The Mummy," a guilty pleasure movie of ours. Stephen Sommers returns as director to this installment that, though released just two years later, takes place eight or nine years after the events of first movie. This is mainly done to add a plot device...oops, sorry, we mean a little kid into the story as the child of Rick and Evelyn, who are again played by Brendan Fraser and Rachel Weisz respectively. The two of them are now married, are both working as archaeologists and live in London. Their young son's shenanigans both save the lives of his parents and act as a catalyst for the events occurring in the film, depending on what the script requires in each scene. Make no mistake, this is the only reason a child was added into the film in the first place. "The Mummy Returns" also marks the feature film debut of Dwayne 'The Rock' Johnson, who plays The Scorpion King. Though he only has a few minutes of actual screen time, this film was enough to catapult Johnson into the highly sought after star he is today. Once Imhotep is resurrected, Rick and Evelyn must find a way to stop him before he takes over the world. While watching this movie for probably the first time since 2001, we couldn't help but feel it's less like a sequel and more like a self-referential parody. Instead of being an average, sometimes thrilling action adventure, "The Mummy Returns" is quick to rely on multiple instances of Brendan Fraser calling back to the original film, hamming up how this is a complete rehash of that story and very little else. While he's not wrong, it's painfully obvious that we've seen this exact same movie, only done better two years earlier. The action sequences are much more goofy this time around. Instead of actual legitimate thrills and a few moments of horror, the sequel wants everything to be a massive slapsticky joke. This is the most apparent during the scene on the bus where everyone is fighting against Imhotep's undead army. Rick exclaims, "Not these guys again!" Oh yes, these guys again. We also can't talk about "The Mummy Returns" without talking about how bad the CGI is. It is not just dated, it was bad even by 2001 standards. The final conflict with the Scorpion King himself remains some of the worst CGI in a major motion picture and big time blockbuster we have ever seen. It's 1991's "Lawnmower Man"-level CGI, only a full decade's worth of technological advances later. We've never seen a director so openly throwing up their hands in acceptance of such mediocrity from their special effects crew. It's as if Sommers said, "well, we can't do any better, so this is what we have to go with." In addition, the film moves at a snails pace to its awful and underwhelming conclusion that it's hardly worth how long it takes to get there in the first place. Except for a couple of entertaining action sequences, "The Mummy Returns" is a clunky, misguided mess of bad graphics and corny dialogue. The acting is somehow worse this time around, and add an inexperienced child actor into the mix and you've got a recipe for disaster. Nothing redeemable about this sequel is enough to make us recommend it, so steer clear unless you really dare. Do we recommend this movie: No. One year ago, we were watching: "Mad Max 2: The Road Warrior"
The goddamn CGI in this movie!!! Arghhhh!!! At the time of this film's release, I know for a fact that better CGI artists and technology was already available. So when I saw The Rock's first appearance as the mutated Scorpion. Erhmagherd!! !